The most reliable profit indicator you’ll ever find in investing. Buy when it flashes and get set for quick DOUBLE-DIGIT PROFITS! The ignored group of funds set to hand you a 30%+ RETURN in the next 12 months – with a big chunk of that IN CASH! 4 incredible fund picks with amazing yields 5 TIMES HIGHER than the S&P 500 average! I’ll get straight to the point. I’ve found an easy way for you to bag double-digit price gains – year in and year out – in your income portfolio. You won’t have to sacrifice a single cent of dividend income to do it. In fact, you’ll be pocketing payouts 5 times greater than what the average S&P 500 investor is forced to take today! I’m talking SAFE 8.7% dividend payouts (and in many cases higher than that). I’m not making that 8.7% figure up. It’s the average payout on 4 completely ignored investments I’ll show you in just a moment. Plus, this weird group of funds delivers 100% PREDICTABLE, market-crushing capital gains too! How does easy 20%+ price upside in the next 12 months sound? Add that to their outsized dividend payouts, and you’re looking at an EASY 30% TOTAL RETURN by this time next year! Here’s the funny thing: You won’t hear a peep about these stealth funds from Wall Street or the mainstream media. But some of the world’s richest people know them very well. Bill Gates has been quietly profiting from them for years. So have Jeffrey Gundlach – the legendary Bond God – and famed investor Bill Ackman, too. And today I’m going to show you exactly how to profit right alongside these investment heavyweights. Clobber the Market. Retire Rich. One of these unusual funds handed investors a stunning 46% gain (including dividends) in just 15 months – easily beating the market! And folks “in the know” had a dead-giveaway signal that it was about to make this stunning upward move. 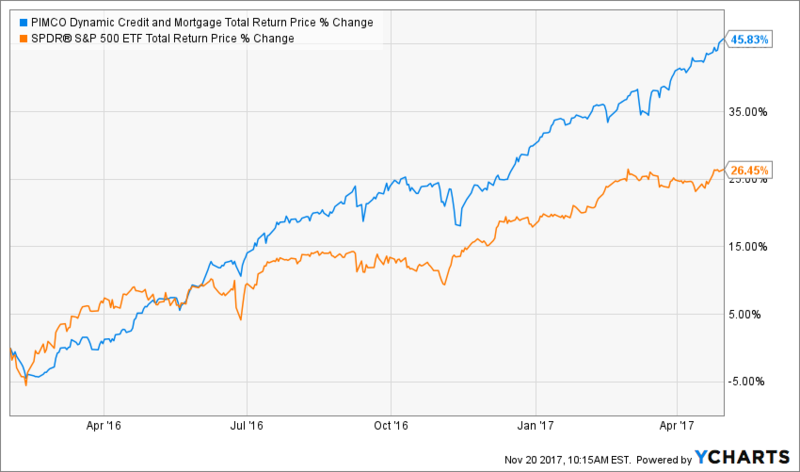 This fund is called the PIMCO Dynamic Mortgage & Income Fund (PCI). It’s part of a powerful (but little-known) group of funds called closed-end funds. 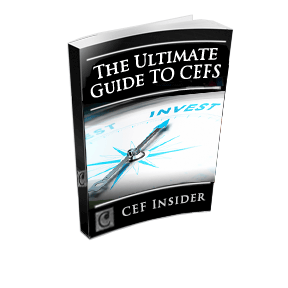 If you haven’t heard of CEFs, don’t worry. You’re far from alone. There are only 500 or so of these low-key income machines out there – so Wall Street analysts don’t even bother covering them. That’s great for us, because CEFs routinely hand investors safe 7% to 12% dividend yields and FAST double-digit gains, too! And since they get so little attention from journalists and the big shots on Wall Street, we can pick up these income wonders at spectacular discounts, as I’ll show you in just a moment. So if you’re at or near retirement – or just looking to grab some extra cash to pay the bills or bulk up your savings, these unsung funds are EXACTLY what you’re looking for. The best part? You can use that dead-giveaway signal I mentioned earlier – the same one our lucky PCI investors used – to precisely forecast when these funds will make their next upward move. The profit alarm I’m talking about is a crucial figure called the discount to net asset value (NAV). We don’t have to get too far down in the weeds here. 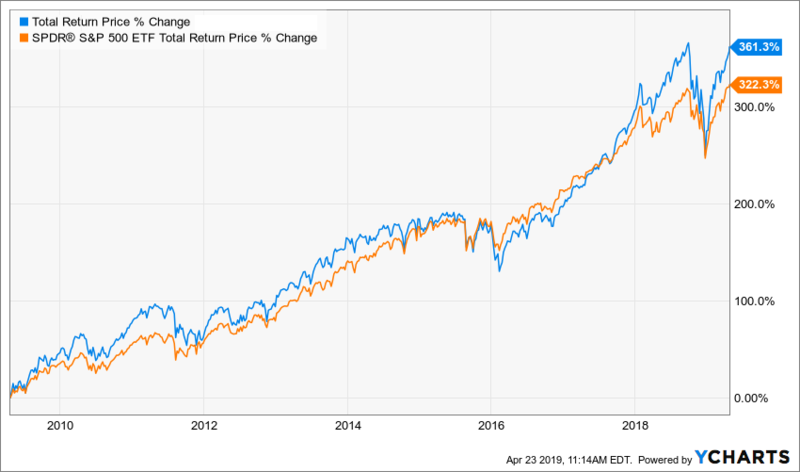 Suffice it to say, it’s the difference between the fund’s market price and value of its portfolio. It’s a common number that’s dead simple to find on any fund screener. Here’s the key thing to know: these discounts are basically free money! Let’s go back to PCI. Back on February 1, 2016, it was trading at a 14% discount to NAV. So buying then meant you got every dollar of the fund’s assets for just $0.86! Absurd discounts like this don’t exist anywhere else in the investing world. But they happen all the time with CEFs. Because these discounts are hands-down the clearest contrarian indicators I’ve ever seen – and an ironclad “early warning system” of BIG gains ahead. You see, the more investors dislike a fund’s strategy, the greater the discount they’ll likely demand. The irony? Most people spend their time chasing recent performance, which means they’re more likely to sell a fund at the very moment it’s due for a turnaround. So when a fund’s discount drops below its historical average, that’s the time to put it on your watch list. And when that discount gets unusually wide – say double the historical pattern … that’s the time to strike. When the herd realizes its mistake and piles back in, you’ll be sitting pretty with an early position. Then you sit back and watch as that discount window slams shut – squeezing the fund’s price to a practically GUARANTEED double-digit gain. And don’t forget, CEFs are income vehicles, so we’ll collect their fat dividends the whole time! This is exactly what happened with PCI: over the following 15 months, its discount slowly bubbled away, closing from 14% to less than 1% – propelling the fund’s market price to that mammoth gain I showed you earlier! And history is about to repeat with the 8.7%-average payers I’ll show you in just a moment. All 4 of these overlooked funds are trading at ridiculous discounts to NAV ready to snap shut and catapult them to fast double-digit gains, just like PCI’s did! 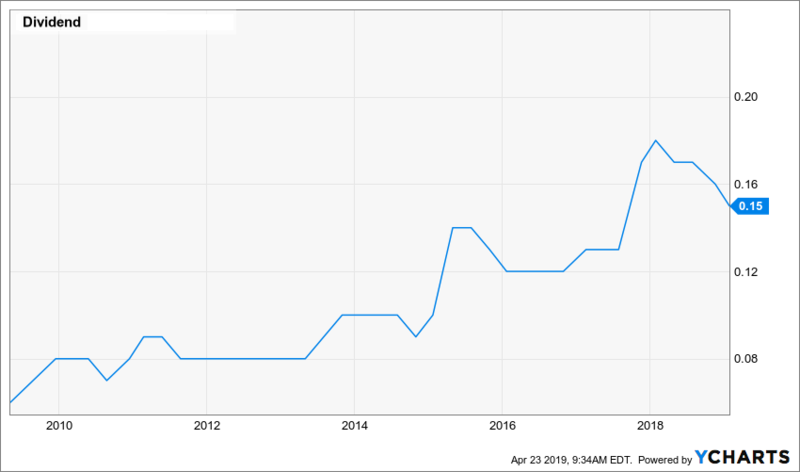 On March 27, 2017, I pounded the table on the Nuveen California Quality Municipal Income Fund (NAC), urging CEF Insider members to jump on the fund’s insane 6.5% discount right away! At the time, it also boasted a fat 7% dividend yield. 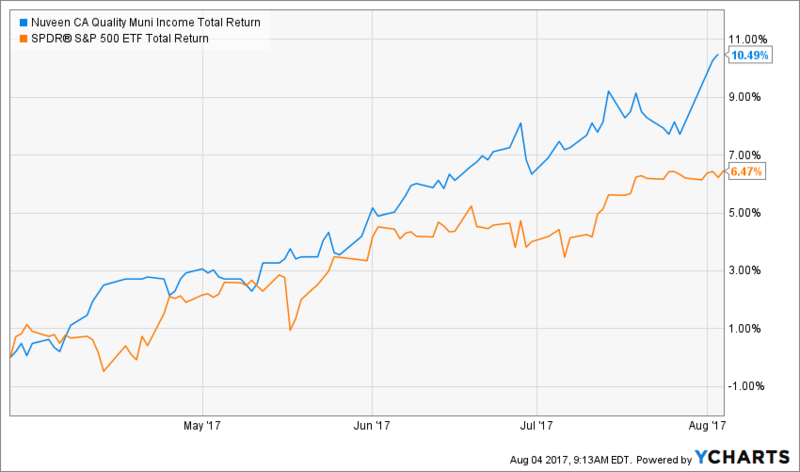 Less than four months later, the gap had closed to just 1% – and we rode NAC to a quick 10.5% in gains and dividends, crushing the S&P 500’s return! As I said, seemingly impossible discounts like this happen all the time in the CEF universe. By now I’m sure you’re seeing the pattern here. Wait for the discount to NAV to close. My name is Michael Foster, and I’m the only analyst in the world who is 100% devoted to CEFs with market caps under $1 billion. Why less than $1 billion? Because this is where the biggest discounts in the CEF universe live. And it’s also a pond that’s strictly off limits to the big guys, so we have these juicy income – and capital gain – opportunities all to ourselves! Think about it: if a big investment house with, say, a $20-billion market cap bought every single share of a CEF with a $500-million market cap and that CEF doubled, it would only boost the buyer’s market cap by a measly 2.6%. It’s just not worth the hassle! But you and I don’t have that problem. I can’t wait to tell you all about these under-the-radar CASH machines – the same ones I used to dump my grinding 80-hour work week as a research professor, boost my net worth and build an income stream that easily covers my bills. My top pick has served up a huge 68% gain since it launched in 2012 and hands us an outsized 8% CASH dividend as I write! But despite that massive gain, it’s still cheap today (more on that in a moment). This unsung income play has delivered this huge return by investing in real estate – particularly real estate investment trusts (REITs) that are throwing off massive yields and poised to ride an unstoppable megatrend: the ever-growing need for more and better infrastructure. And that’s far from the only reason why this fund tops my list. Because the team at the top has carefully calibrated its top holdings to focus on the infrastructure that will be in the highest demand as the 21st century continues to unfold. I’m talking about the safest electrical utilities (including renewable power producers) around the world, cell tower operators and, best of all, warehouse owners. That last group is perfectly positioned as the online shopping bonanza rolls on and their properties burst with the wares of big sellers like Amazon.com. 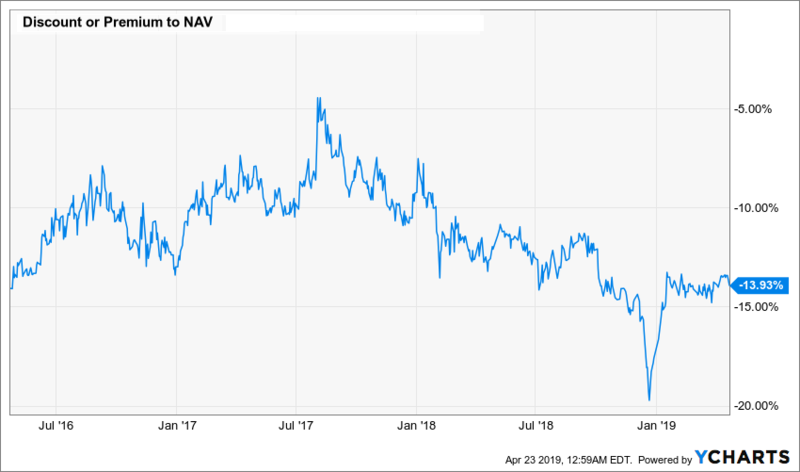 And now is a terrific time to buy – because a totally ridiculous selloff has left this fund trading at an unusually large 14% discount. That’s despite this fund’s outsized dividend, incredible outperformance and class-leading management team! But as you can see above, that markdown has already started to stair-step higher this year, and its recent pause won’t last, as bottomless infrastructure demand drives new investors in. If you want to set yourself up for an easy 20% GAIN in addition to your 8% dividend, you need to act fast! I’ll show you how in just a few seconds more. My second pick is trading at a silly 8% discount as I write this. That wide discount stems from the fact that “first-level” investors are in a lather about my No. 2 pick’s main holding: junk bonds. You see, the herd is living in the past, writing off these bonds because the Federal Reserve’s low-interest-rate environment caused their yields (and the yields on pretty well everything) to shrink. But here’s the truth: times have changed, with the Fed raising interest rates in the last few years, a trend that will likely continue in the long run – even if rates are on “pause” as I write this. 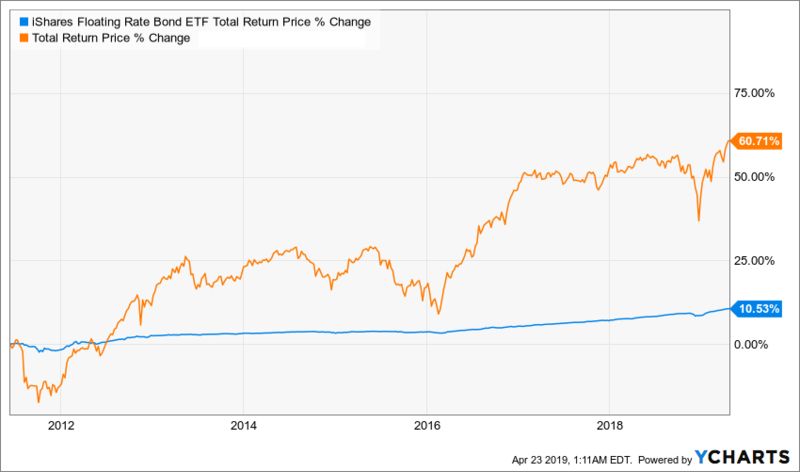 But either way, the rate hikes we’ve seen so far haven’t yet translated into big payouts from junk-bond issuers – a lag that’s common with these investments … and one that we can take jump on before these cash hits roll in. The fund’s current discount doesn’t account for this – but it’s only a matter of time until it does! And here’s the kicker: management is truly top notch: the fund is run by a 4-person team with a total of 115 years of experience between them! There’s no reason to hold off on this one. Let’s profit from these whip-smart pros at a ridiculous discount now. Don’t let the jargon-y name hang you up: it just means that this income juggernaut loans cash at great rates now, and those rates will ratchet higher as they catch up to the Fed’s string of rate hikes, which they still haven’t done. Its clients are high-quality American companies (427 in all, nicely spread out across 35 different industries). The best part? It’s handing this cash over to us in the form of its fat 6.7% dividend. Meantime, the value of the loans themselves is heating up, handing us a golden opportunity to grab some solid double-digit upside, too! When you’re investing in areas like this, you need the very best talent at the helm, and that’s what this fund delivers: its 2-person management team are canny operators with 19 years of experience and a proven record, managing upwards of $27 billion in investments during their careers. The topper: This fund is easily out-earning its dividend, setting us up for even higher payouts in the future. 10.7% Payer That’s on Sale Now! I’ve saved the best for the last with our fourth and final pick. This one boasts something most people will tell you can’t possibly exist: a double-digit dividend that’s grown at a triple-digit rate! How does this fund do it? Simple: it’s built an investment all-star team by cherry-picking the very best managers from 5 outside investment firms. This proven crew then invests in a “no-gimmicks” portfolio of value and growth stocks, all of which have deep moats protecting their businesses – names like Visa (V), Microsoft (MSFT), Alphabet (GOOGL) and Abbott Laboratories (ABT). So how has this all-star team performed? And if you hear “investment all-star team” and think “high fees,” fear not. This fund charges just 1.01% of assets, one of the lowest fees in the CEF universe! Finally, this fund trades at an unreal 5.1% discount as I write. It’s only a matter of time before that shifts to a massive premium, given this fund’s market dominance, 10.7% yield and 150% dividend growth. The time to buy is now. My first report, “4 Great CEFs to Buy Now: 8.7% Yields and 20% Upside Ahead,” gives you all the profitable details on my top 4 CEF picks. Names, ticker symbols, buy-under prices and all the nitty-gritty you need to know before you buy. Full details on how each fund makes its money, what’s behind its unusual discount and why that gap is set to slam shut, propelling us to 20%+ price gains – and more – in the next 12 months! In-depth analysis of the people behind each of these funds. This is something too many investors ignore but is absolutely vital for safe CEF profits. Since CEFs are all I cover, I spend my days studying the moves of these investment pros. And yes, that includes personally phoning them up and putting them on the hot seat. How CEFs can pay outsized dividend yields – and a simple way to make sure your fund’s payout is sustainable. The simple trick CEF managers regularly use to keep their funds’ discounts from getting too wide (this unique “insurance” simply doesn’t exist in stocks, bonds or ETFs). The surprising reason why the liquidation of a CEF is actually good news for investors. Outrageously high fees hidden deep in the fine print (in one case, management is snagging an obscene 48% of the fund’s investment income for itself!). Way too much leverage: one of these funds uses borrowed cash to buy other CEFs that are propped up by borrowed cash themselves! When the next downturn hits, this one is hardwired to double up the market’s losses – or worse! Dangerous dividends, like the ridiculous 18.5% one fund pays. Too bad that payout is built on risky, illiquid derivatives. If you want to rack up steep losses fast, this is the fund to buy! 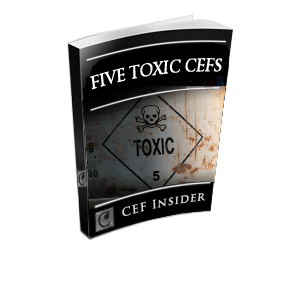 To get your copy of “4 Great CEFs to Buy Now,” “The Ultimate Guide to CEFs” and “5 Toxic CEFs That Could Ruin Your Retirement,” I simply ask that you take a risk-free trial to the research service I mentioned earlier. It’s called CEF Insider, and I’ve designed it specifically for investors who aren’t afraid of snagging double-digit price gains like the ones I’ve showed you throughout this report, year in and year out, in their income portfolios. And that’s to say nothing of the outsized 8.7%+ yields I’ll bring you every single month! After all, who wouldn’t want double-digit gains from their dividend investments? Given that most people look to these holdings for income alone, this is basically free money! Even so, CEF Insider isn’t for everyone. It’s a unique service I’ve custom built for folks who want to go further than the average investor to get in on the very best CEFs for high, safe income and massive upside. Our streamlined CEF Screener lets you sort through the more than 500 funds in the CEF universe worth your consideration at the click of a mouse. Sort by ticker symbol, asset class or discount/premium to NAV and you’ll instantly see how each CEF stacks up to its peers. This one-of-a-kind fund-picking tool is backed by a rigorous 6-point assessment that judges each CEF by its current and historical NAV, 10-year return, fees, yield on NAV (the best measure of dividend safety) and much more. That’s not all. You also get our one-of-a-kind “CEF Insider Heat Map,” which instantly separates attractive funds (green) from dangerous pretenders (red). It’s like having me personally guide you to the CEFs worth further consideration for your portfolio. I’d normally charge $99 a month for access to the Screener alone – but you get it absolutely FREE when you try CEF Insider. CEF Bargains … and Ripoffs Too! Our easy-to-use CEF Index Tracker lets you instantly compare the performance of practically any CEF to any other CEF and stack up as many funds as you like to our proprietary CEF Indexes. The bottom line: At a glance, you can see which CEFs have outperformed (and may be overpriced) and which have underperformed (and may be screaming bargains)! There isn’t another CEF tracker anywhere on the Web—paid or free—that lets you do this, which is why I just added this revolutionary tool to your CEF Insider trial membership. A $99-a-month value, you also get the Index Tracker FREE as part of your CEF Insider subscription. Members-Only Portfolio: These are the “best of the best” – my top CEF picks for high, safe income and big gains right now. All of them are laid out in an easy-to-read portfolio that includes my up-to-the minute recommendations, buy-under prices, current yields, discounts to NAV and much more. Monthly Issues: On the fourth Friday of each month, you’ll get my latest analysis of the ever-changing CEF space right in your inbox. I’ll include detailed analysis on new fund recommendations, updates on existing positions and an overview of trends and events that may affect your holdings. Weekly Analysis: Sent straight from my desk to your inbox, you’ll get my weekly investing ideas on CEFs I’ve been watching and analysis of major market events. Flash Alerts: You’ll never have to worry about missing out on breaking news on the CEFs in our portfolio. I’ll have an eye on all of them 24/7 and will email you right away if there’s ever any change in our position. Unlimited Access to the Members-Only Website: Day or night, you can log into our password-protected website, where you’ll find easy access to all of our resources, including the CEF Screener, Index Tracker, CEF Watch List and the full portfolio. You also get a complete archive of our monthly issues, special reports and Flash Alerts, so you can see how our recommendations have changed over time. If you’ve read this far, I’m guessing you think these high-yield funds may be a good fit for your portfolio. I’m so confident you’ll profit from my research that I’m going to give you 60 days to try CEF Insider absolutely RISK-FREE. Simply click here to start your Charter Membership today. Download your special reports, read the latest issue, kick the tires on our CEF Screener and Index Tracker and start following one or two picks from the portfolio. Then enjoy the next couple issues of CEF Insider, my weekly column and all the other benefits of your full Charter Membership. If after nearly two months you don’t feel the advice has more than covered your cost, or if it’s just not right for you, simply let me know and I’ll issue a full refund of your membership fee. That’s 100% of your money back, no questions asked. Plus you’re welcome to keep the FREE special reports as my thanks for trying the service out. But I have to tell you something here. I’ve built CEF Insider for people who truly understand the explosive gains and double-digit yields these ignored funds offer. Then taking me up on a risk-free road test of CEF Insider is a no-brainer! As I mentioned, CEF Insider is a totally unique service, so it’s vital that we keep our group small. I’m only letting in 900 members to CEF Insider in total. You read that right: just 900 people, and nearly 800 folks have already snagged spots! So once we hit that 900-person limit, I’m closing the doors. If you try to sign up after that, your name will go on a waiting list, and you’ll only be able to get in when another member drops out. I expect those remaining spots to go fast. Especially when folks see the eye-popping gains and outsized income we’re talking about here. I don’t want you to miss out, which is why I’m urging you to start your no-obligation road test right now … while this is in front of you. To recap, you get a full Charter Membership, with full access to our powerful CEF Screener (a $198 value) and Index Tracker (a $198 value). Plus you also get the CEF Watch List, the complete CEF Insider portfolio and ALL of our premium research. Plus you’ll also receive 3 FREE research reports (a $297 value), weekly email updates and alerts, and a full 60 days to decide if you like the service. And it’s all completely RISK-FREE. I don’t see how you can lose here, because I’m the one taking all the risk. All you have to do is click the button below to get started right now. In the coming months, many investors will still be on the sidelines, fearful of global events or waiting for the next utterance from Fed Chair Jerome Powell. Meantime, our CEF Insider members will be quietly pocketing their 8.7%+ CASH payouts and watching their funds’ prices start their relentless upward climb as their unusual discounts swing shut. Don’t be left on the sidelines. Start your no-risk trial to CEF Insider now. P.S. 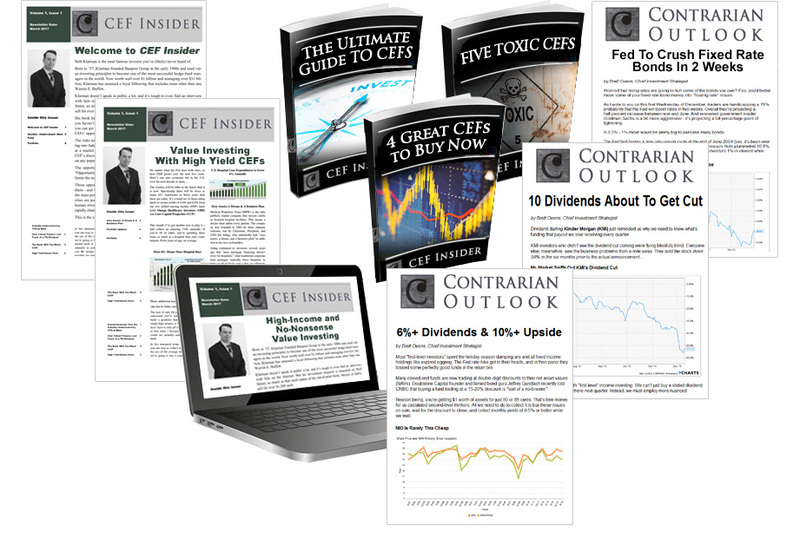 As soon as you join CEF Insider, you’ll have immediate access to our CEF Screener, Index Tracker, Watch List, the complete portfolio, your 3 special reports and your first issue. 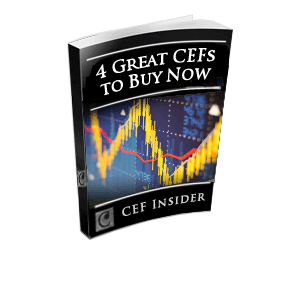 The 3 reports and two months’ access to the Screener and Index Tracker alone are worth $630.00, but they’re yours free as a new CEF Insider member. P.P.S. The clock is ticking! Other investors are reading this invitation right now, too, and I expect our remaining seats to fill up fast. You can’t afford to hold off on this one. Simply click on the button below. You have no risk and no obligation whatsoever.